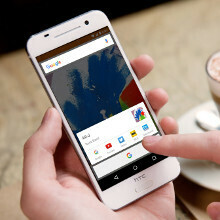 No matter how you slice it, the newest member of the HTC portfolio, One A9, is one good looking handset, to the nine. With "bead-blasted"
brushed metal chassis, and a dual-tone finish available in a Carbon Gray, Opal Silver, Topaz Gold and Deep Garnet, the One A9 certainly stand out as a uniquely HTC design. This time around, the company outfitted its newest midranger with optical image stabilisation for the camera, and a fingerprint scanner, ready to brawl with any of the midrangers, mainly from China, that have been offering these goodies for a while now, plus it set the price to match. For $400, you are getting the premium design feel you see in the slideshow below, 1080p display, 13 MP OIS camera, BoomSound, a dedicated audio DAC, finger scanner, and 32 GB of internal storage, not to mention that there is a microSD slot for expansion. Not many handsets can brag with such a setup at this price, so HTC might be really on to something here. Check out the official pics below. I'm sure it will be more than ok, but for $400 they're probably not trying to beat the competition. This HTC A9 phone is such a stunning device . camera is so sharp and fast. I tried play with it on hand and felt it. this is gonna be a iphone killer for sure. When Samsung released midrange Galaxy A8 for more than $450 noone bats an eye. When HTC releases its own midrange A9 (which, at least what I can tell, is clearly Galaxy A-series competitor), for $400 and less, everyone goes crazy. holy cow that looks noice. i would buy hella out of that. Should have used all of this pointless advertising money to get Qualcomm to give you the SD820 early like Google gave you early access to marshmallow. Anyone find it hilarious like Google now on tap saves you much more time, is simpler to use, and doesn't require super brick hardware unlike 3D Touch? I think it's hilarious, damn Apple and their sheep. Look its an iPhone 6/6S with the camera shoved to the middle. So it must be with the deal HTC/Apple signed, they can use each others looks? Because First Apple "borrrowed" the M8 looks for the iPhone 6 down to the antenna bands, which look ugly on both phones. HTC, this is why you are falling from grace. You phones are just ugly now.